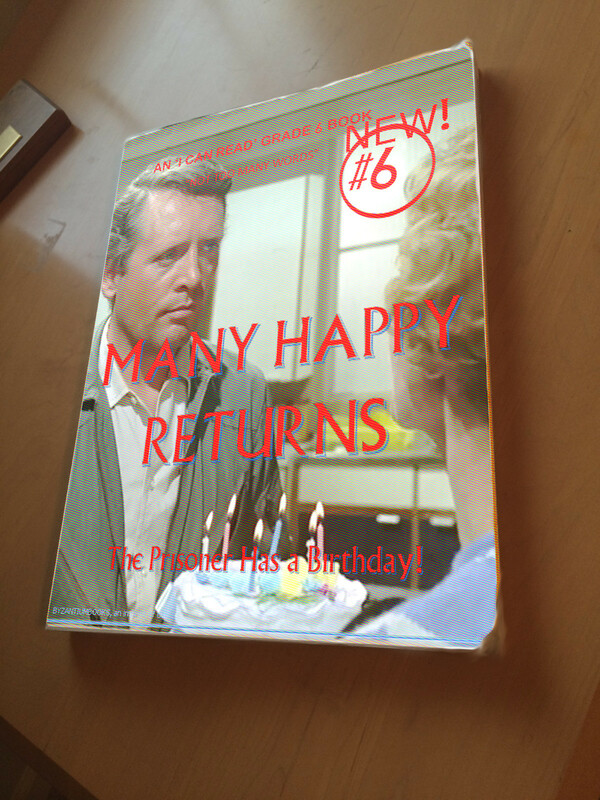 I made the basic image for this book in GIMP a few days ago, using a clip from the “Many Happy Returns” episode of The Prisoner (near the end). Most of the text I created in Word, converted to pdf, and opened as layers, positioned and sized, and anchored (or merged). I do this because I still haven’t figured out why GIMP doesn’t correctly display the Village font. 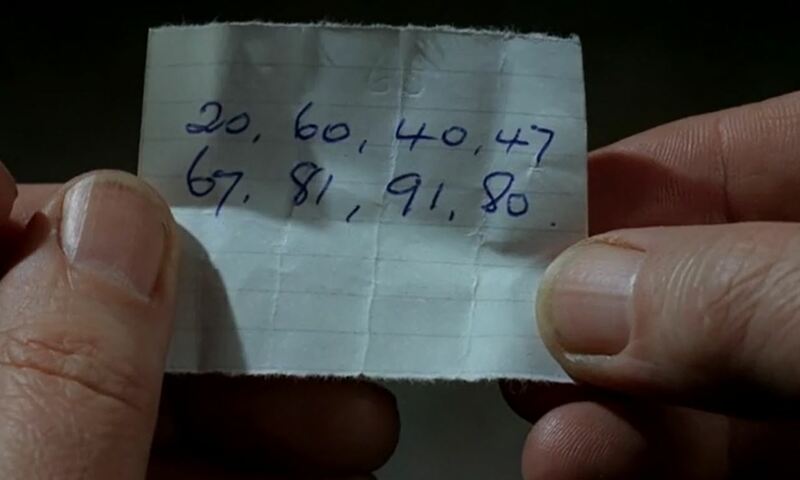 The quote under the title refers to the ease of reading the text, as well as the lack of dialogue in the episode. Once I made the book cover, I realized how flat it looked. It needed work to look more realistic. To get a more three-dimensional look, I took a photo of a handy book with mostly plain white cover (it was The Millennium Whole Earth Catalog) sitting on my desk. The angle allows a slight view of page edges, but I needed to adjust my image to fit on the book. It was easy enough with the Perspective tool, grabbing and moving the corners to match the corners of the underlying book. I then used the Smudge tool to rough up the edges just a little bit. After all this, I thought the cover still looked too fresh and unused. So, I used the free select tool to isolate the book, and found under Effects->Distorts->Video the ability to make a surface of small dots, simulating a paperback cover printing process. Overall, this was a good exercise in learning. 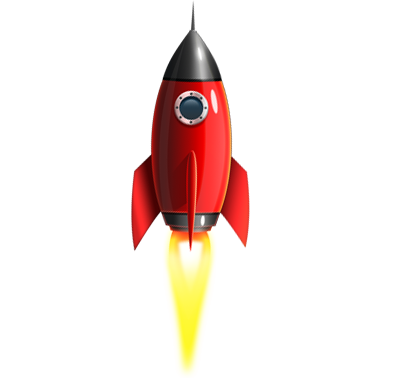 Not only did I try some tools in GIMP, but I had to think about design. Of course, I used the Village font, but how about placement of the wording, cropping of the picture, etc? I had accidently left a blue line near the bottom (from my media player), but I took advantage of that to put a publisher’s name in the same color just above. If I were to start over, I would not use a photo cover, but would go for a more minimalist look. But, if I remember right, TV shows and movies often had spin-off novelizations, and they often used photos from the original productions for the covers. It is a good marketing design (if not artistic) so the interested consumer identifies the tie-in. By the way, no author is credited on the cover. It was probably written by a team of hack writers working from the original script, piece work, no royalties. 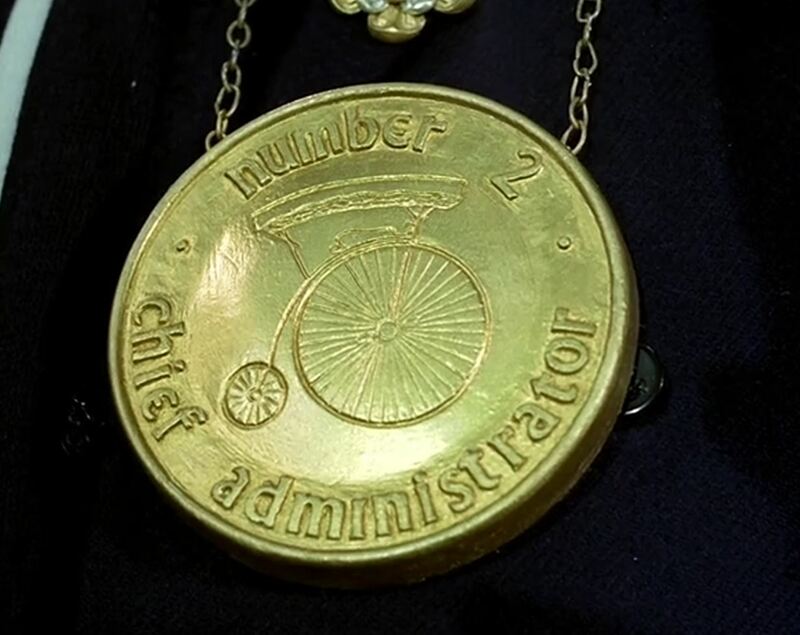 In the episode “It’s Your Funeral”, Number 2 is honored during ceremonial occasions to wear the golden Great Seal of Office. 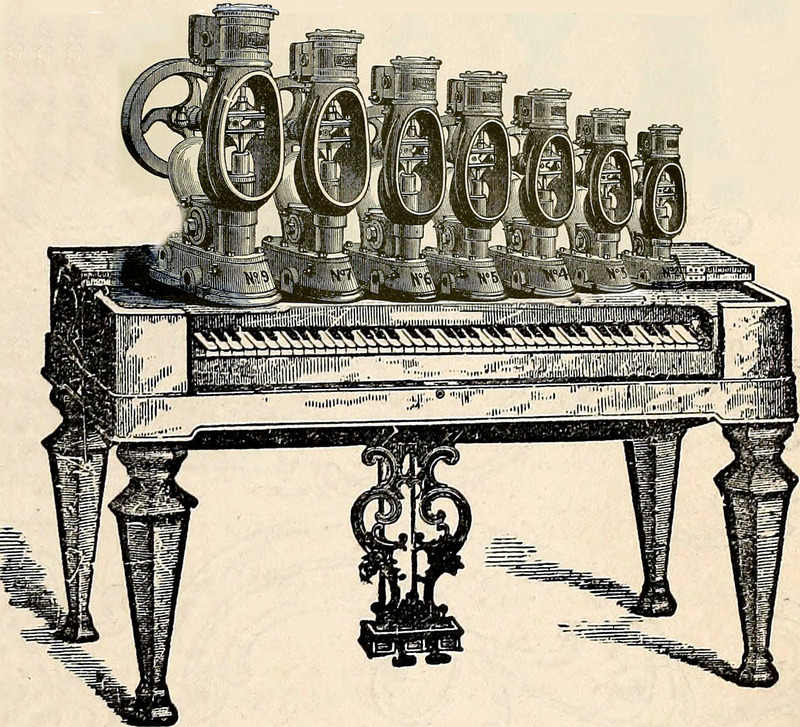 In the scene in the watchmaker’s shop we see a rare glimpse into the design process. 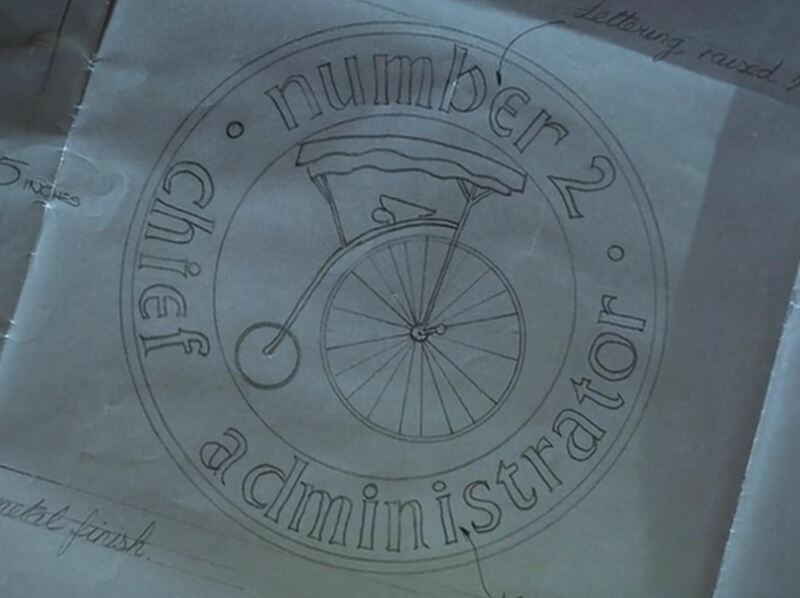 Left laying around for all to see is the original designer’s sketch of this seal! As is common when analyzing ancient manuscript documents, I found it useful to record my experiments with various lighting conditions from various angles. For simplicity in this presentation, and in presenting the evidence of my conclusions, I show only the results for light from the four cardinal directions, and I do so in rotating images. As you see, in natural light, no particular artifacts of creation are evident. One sees the inscription in the normal Village font, and the central icon of the Village pennyfarthing. Exposed in near-ultraviolet light, we see some additional information developing on the surface. There are areas of differing colors showing variations in the surface texture. The spectrum from red through violet shows increased surface height. One would think that a piece of drafting paper would be smooth, but here there is apparent evidence of unevenness. Finally, I found the need to slow the rotation to better see the square areas that appear from some angles. In slow motion, you can observe this “pixelization” of the surface. Normal paper does not behave in such a manner. Note that you can see the effect better if you click on the image to view it larger in your browser. “What does this mean?” to quote Dr. Martin Luther. 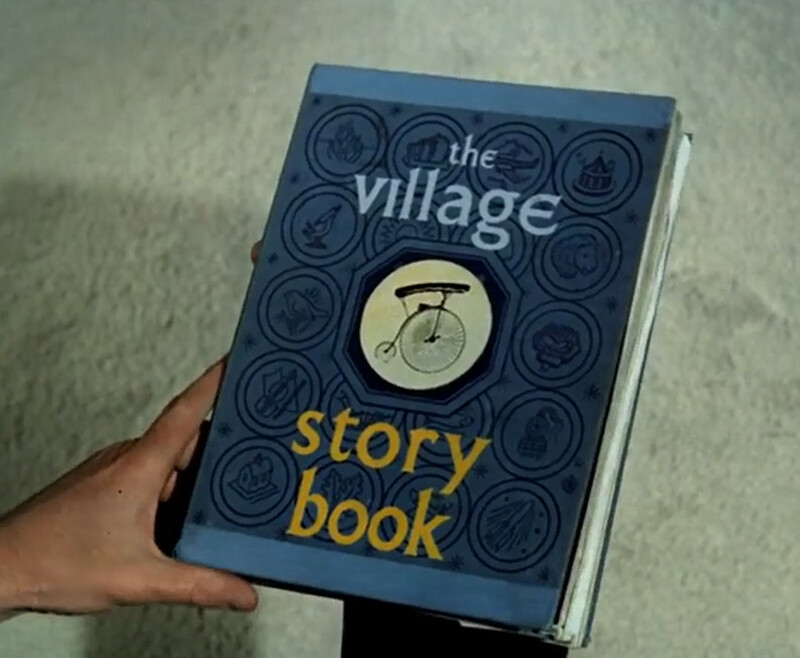 Apparently, the technology of The Village included elements more advanced than most of the world knew in the 1960s. This paper is actually synthetic paper made of nano-liquid-crystal. To our knowledge, this nLCD type of display is just now coming to market in advanced technical centers, such as Tokyo and Singapore. To find it in The Village is evidence beyond what we were looking for. The nLCD paper the watchmaker is using to draft the seal of office is nothing less than an artifact from the future! The next stage of research must now shift from design, to source. Where and when could this nLCD paper originate? And how and by whom was it delivered to The Village? Unfortunately, these questions cannot be answered at the present, but must wait for time to progress. Investigating The Tally Ho – What’s It Got to Say? 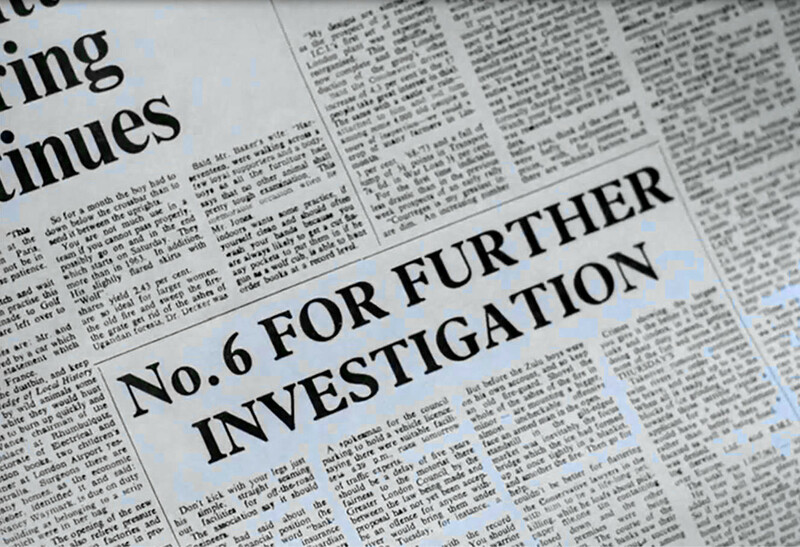 While watching the various episodes of The Prisoner, I’ve noticed that the Village newspaper, “The Tally Ho”, usually has nice clear headlines, but it is difficult to read the stories. Since it would not be reasonable to read while the video is running, I have clipped several examples from individual frames. First, one must realize that the papers are made up for one-time use in the show, not to be actually read. As such, they are filled with filler text. A close look shows that the vast majority of the text is English, possibly taken from other newspapers, but each line is out of context with the next, paragraphing and word-splitting is off, and there is really no sense. As seen in Figure 1, the job was done quite nicely. It was not a quick cut-and-paste (in the original sense of scissors and glue), but possibly typeset pages were used. An exception to the nice typesetting is the actual cut-and-paste of a chess puzzle (Figure 2). 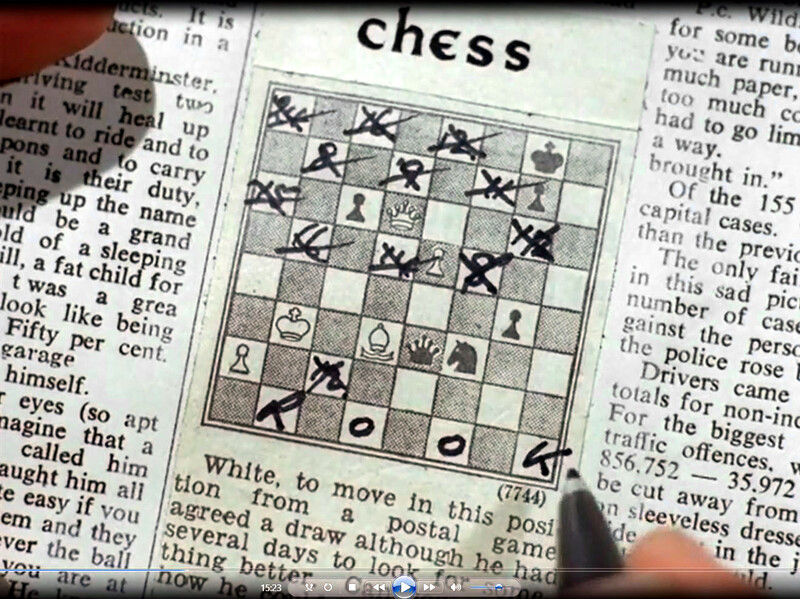 Taken from the “Checkmate” episode, we see Number Six making annotations on the chess puzzle in his effort to confuse Number Two with a possible conspiracy. When you look at the page, though, the puzzle, its description, and its title are pasted onto a page that is similar to other editions. And it’s not a really good pasting job, either. You can see the edges, and even text extending a bit beyond, since the clipping wasn’t quite the right size. I was interested in the source of this chess puzzle. 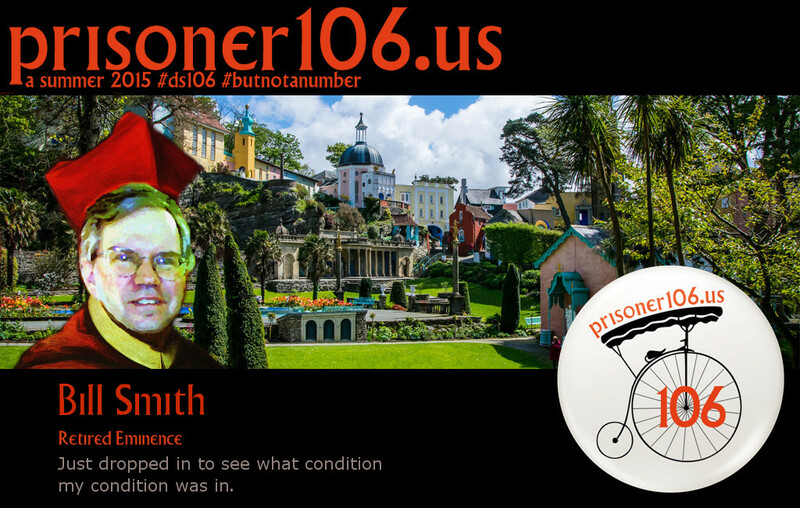 It turns out others have been interested, and I found the answer at Chess and The Prisoner. 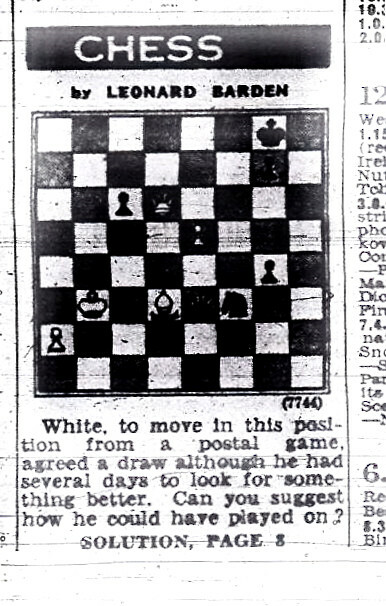 I include their image (Figure 3) of the original puzzle as it appeared in Evening Standard of 9 January 1967. 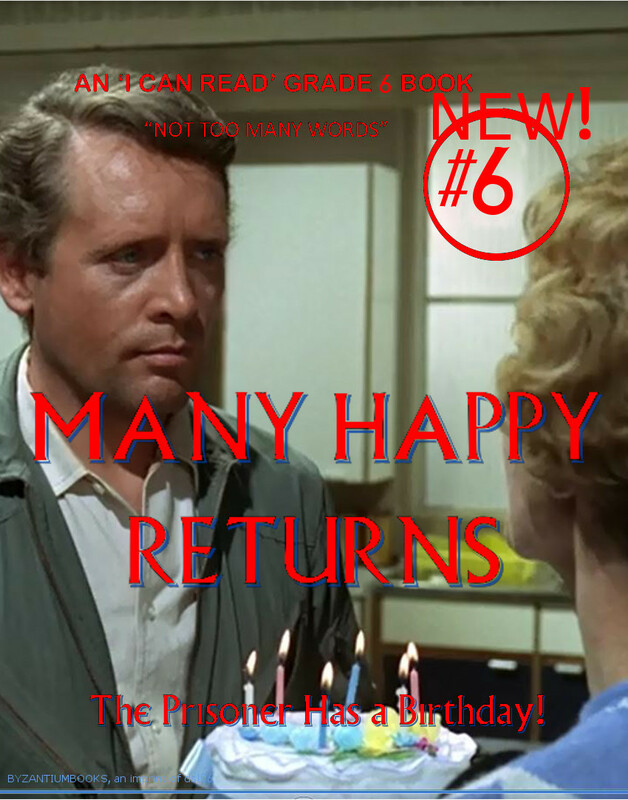 In passing, I wonder if the producers of The Prisoner obtained copyright clearance, or if they thought of the fair use doctrine, or just did their thing without worrying too much. Many times, television and movie producers will make sure that even such trivial details as newspaper text will look authentic. Too many times sharp viewers have found such discrepancies that are an artifact of creation that take the viewer into the interstices between the fictional work and the methods used to create it.